Purchases at motor vehicle and parts dealers were down 0.9 percent due to less spending at new car dealers. 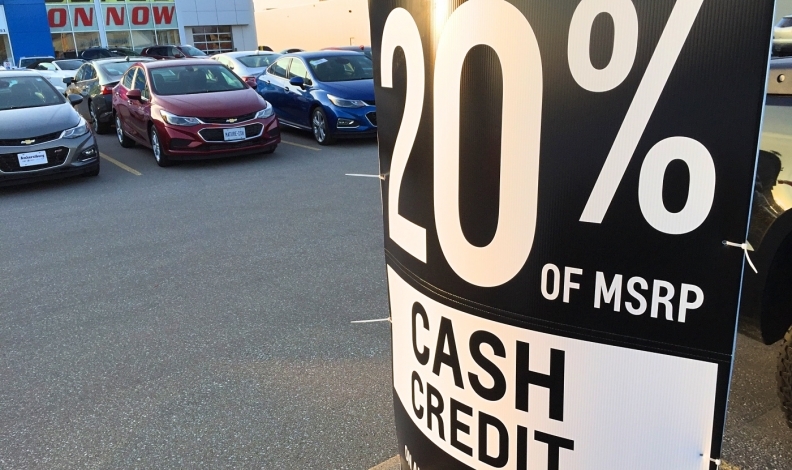 Canadian consumers bought fewer new cars and spent less during the holiday shopping season, leading to an unexpected retail sales decline in December 2016, according to Statistics Canada. The 0.5 per cent decrease in overall retail sales reported by Statistics Canada on Feb. 22 marked the biggest drop in nine months and was worse than economists' expectations for sales to be unchanged. November data was revised slightly higher for a gain of 0.3 percent. Purchases at motor vehicle and parts dealers were down 0.9 percent due to less spending at new car dealers, which offset increases elsewhere in the sector, including used car dealers. New-vehicle sales in December 2016 were down 2.0 per cent over the same month in 2015, according to the Automotive News Data Center. However, the industry still set an annual record of 1.95 million units sold, up 2.8 per cent over 2015. Stripping out the effect of price fluctuations, December's total retail sales volume was down 1.0 percent. The retail figures bucked the trend of recent data pointing to a strengthening economy in December. The decline in volume "puts a dent into what was otherwise looking like a firm performance for December GDP," said Nick Exarhos, economist at CIBC. Nonetheless, fourth-quarter growth should still come in at around 2 percent, he said, cooling after a strong rebound in the third quarter. The Canadian dollar weakened to a two-week low against the greenback following the data. The weak reading could give the Bank of Canada more reason to maintain its dovish tone when it meets next week. The bank is widely expected to hold interest rates at 0.50 percent. "It does hammer home the theme that we have been saying, that the Bank of Canada has been saying, that there is no impetus for the Bank of Canada to follow the Fed in tightening," said Andrew Kelvin, senior rates strategist at TD Securities. Kelvin said the data will push fourth-quarter growth closer to the central bank's forecast of 1.5 percent, though the economy should still exceed that. December's decline, the biggest since March, was widespread, with nine out of 11 sectors posting lower sales. Sales were also weaker at stores typically tied to holiday shopping. Clothing purchases tumbled 3.7 percent, while sales at electronics and appliance stores fell 2.3 percent. General merchandise store sales were down 1.3 percent, the second month of declines in a row. Sales were up 3.7 percent for 2016 overall, the biggest increase since 2014, with volumes up 2.5 percent. Consumer spending has helped underpin the economy in recent years, though that has served to drive household debt compared to income to a record high.